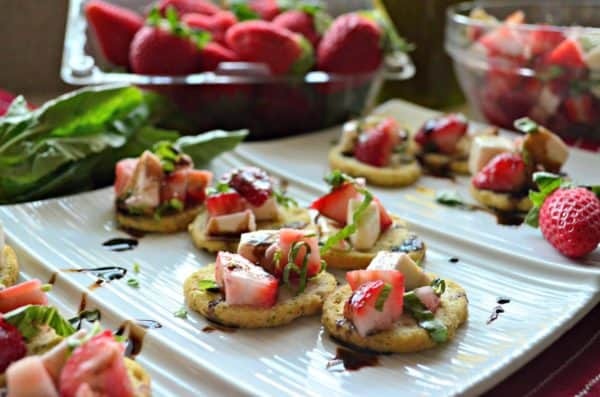 Utilize the fruits of the season and entertain in style with my easy-to-make 10 minute Strawberry Mozzarella Bruschetta recipe! I’m back with another fruit recipe today. This time in the form of an appetizer. I guess you could say one of my cravings this pregnancy is fresh fruit. Cold fresh fruit, and boy have I done my job at consuming lots and lots of fresh strawberries. By the pint-full! Good thing they are so good for you and full of vitamin C! 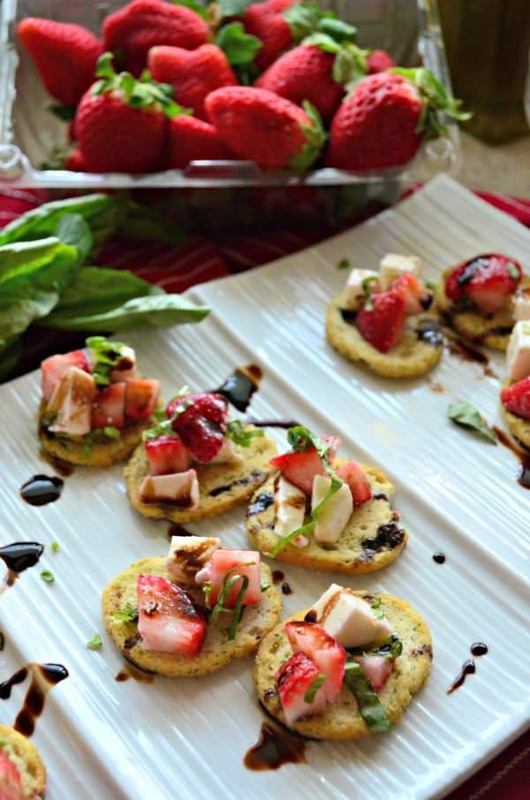 If your looking for a flavorful and fun twist on bruschetta? 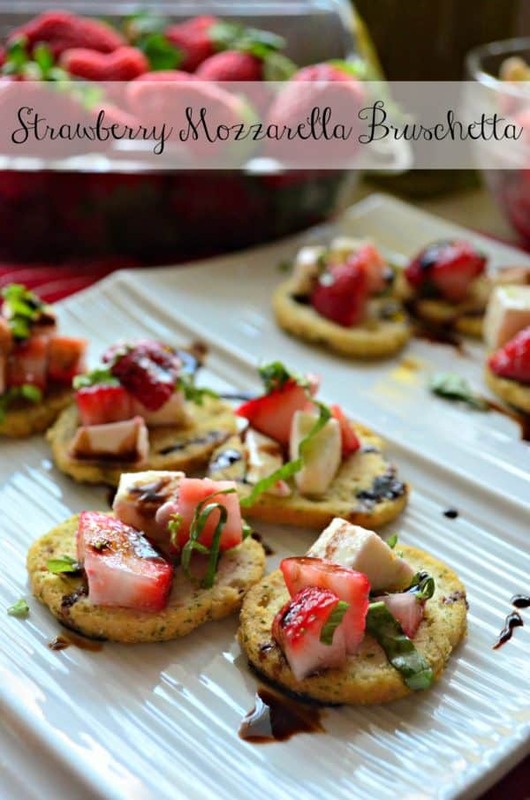 I’m so excited to share my recipe for Strawberry Mozzarella Bruschetta today. It’s a bright and cheery, and quite unexpected for most guest. Most people think of bruschetta reserved for just tomatoes but move over their is another red fruit in town, and that’s the strawberry! This is a super easy and yet fancy appetizer that you can whip up in a jiffy with just a few ingredients! I almost always have fresh mozzarella on hand and I grow my own basil just about year round. Strawberries are in season here in Florida from November-April and of course in season in the rest of the country through the summer months–so I almost always have strawberries on hand, too! I buy a few pints at a time! Olive oil and a good store bought balsamic reduction are always stocked in my cabinet too. When I don’t have a freshly baked baguette on hand I have baguette crisps which are very similar and have saved me many times when entertaining on the fly! I can whip this together in less than 10 minutes time. I store the strawberry mozzarella mixture in the refrigerator until it’s time to plate. Then, using a spoon I just spoon on a little topping on to the baguette. I finish it off with a drizzle of balsamic reduction and my fancy appetizer is done. So as easy as that with a few staple ingredients you can entertain on the fly and make my Strawberry Mozzarella Bruschetta. Rinse and slice the stems off the strawberries. Dice the strawberries and place in a medium size bowl. Then dice the mozzarella and add to the same bowl. Take half the basil leaves, stack them on top of one another then roll tighlty--thinly slice to create a chiffonade. Sprinkle over the strawberry and mozzarella. Repeat until all the basil leaves are used. Then drizzle the olive oil on top. Mix well and spoon on to a baguette. Drizzle with balsamic reduction and enjoy immediately. *You can prepare the strawberry mozzarella mixture ahead of time then spoon on to a baguette just before serving! Store leftovers in an airtight container for 1 day in the refrigerator.